Marma points are an important element of Ayurveda’s healing power. These energy points profoundly affect the body, mind and spirit as well as facilitate the deepest levels of healing. Stimulating marma points directly taps into the individual’s reservoir of energy and promotes good health. 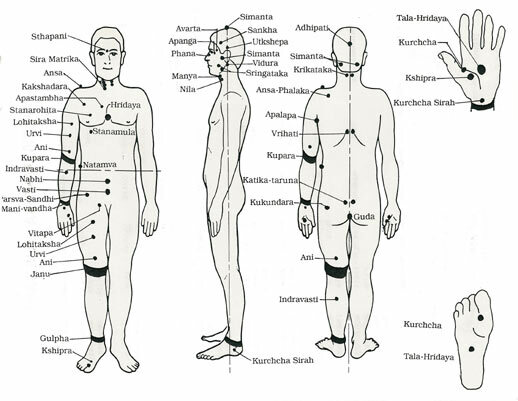 There are 107 major marma points in the human body (Face, head,arms, legs, abdomen, chest, back and trunk) which are connected to the seven chakras, while the minor marma points are found around the torso and the limbs. Stimulating the marma points affects the chakras and the doshas (types of energy in the body). It also stimulates the various organs and systems of the body. Special Carrier and Aromatherapy oil blends are used depending upon each person’s Ayurvedic dosha type and their needs. Marma Point Massage is an effective, yet gentle technique that works similarly to Chinese acupuncture but without the use of needles, to relieve joint and muscle pain in the body. It also treats various other symptoms such as digestive disorders, anxiety, endocrine imbalance , as well as organ weaknesses. It is a beautifully slow, soothing and nurturing treatment . Deposit €50 (non refundable ) secures a place.